If location is everything, then Ragley Gallery and Studios is way ahead of the crowd. the beautiful stately home just outside Alcester. The sun shone and there was a brisk breeze but the views across the long path leading into the distance, the woods and big skies was stunning. 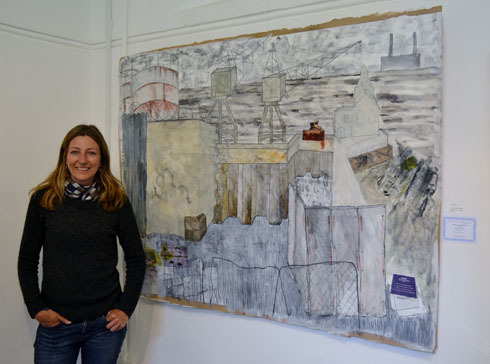 Dawn Harris is enjoying her second year as artist in residence at Ragley Hall, and she works alongside four other artists in studios in the lovely old stable block. Earlier this year she announced the first Ragley Open, and it attracted an impressive 209 entries, with 54 artists chosen to exhibit their works in the gallery which is also in the stables. The theme of the exhibition is Spirit of Place, and Dawn has described this as fitting into three different categories: “all works refer to the tangible physical aspects of place, (monuments, boundaries, rivers, woods, architectural style, rural crafts styles, pathways, views, and so on); to the invisible weave of culture (stories, art, memories, beliefs, histories, etc.) and to the presence of people (the presence of relatives, friends, kindred spirits, and the like)”. You could say that encapsulates pretty much everything, but while I was looking around the theme slipped from my mind anyway, and I was impressed with the general high standard of works on show. One of the judges of the Open was Coventry-based artist and sculptor George Wagstaffe, who attended the opening event. 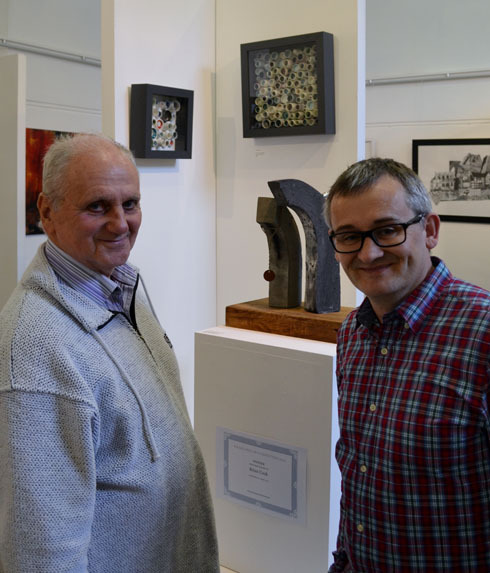 He has previously exhibited recent sculpture at Ragley, and at the Michael Heseltine Gallery in Banbury, and is currently working on some paintings which I look forward to seeing in a future exhibition. 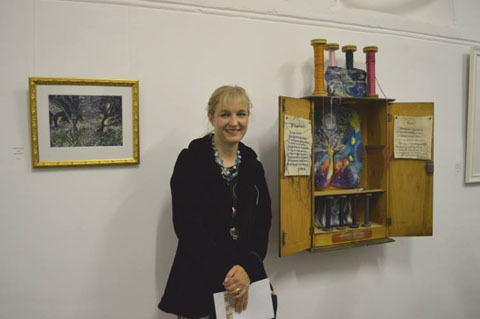 Textile artist Michala Gyetvai who works from a studio at Ragley presented the winners with their prizes – though luckily first prize winner Brian Cook was late arriving from his home near Malvern, so gave us a bit more time to enjoy the Cava and the view! Brian’s winning work was Two Soldiers in a Supportive Conversation, a small abstract sculpture made mostly of concrete, but also including oak showing two shapes leaning in towards each other. Brian studied as a mature student at Worcester University between 2009-12. He said: “I graduated, and since then I’ve been enjoying making art. “I came across concrete when I was at uni. I was working in ceramics but I wanted to make things bigger. My pieces were originally a lot heavier – when you are at university you are in this bubble and can create and there’s no worry about transporting things. I won the Foundation final award and since them I have progressed a bit and come into polishing and looking more at the shape. There were four highly commended awards. 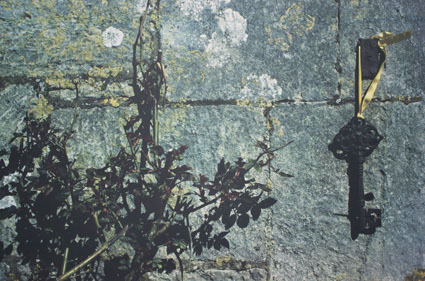 Denise Startin, who has previously studied at Coventry University and the Royal College of Art in London, won for Charlotte’s Locks, a very close-up limited-edition screenprint of a key hanging from a lichen-covered wall, and Linda Davies for Bawley Bay, a large mixed media on board showing an industrial scene of cranes, barbed wire, the Thames and a union safety notice. Contrastingly, also highly commended was Janet Rose for her gentle, colourful textile work, Walled Garden, and Janet Tryner for Field C, a mixed media work which struck a chord with me and any other festival-goers as it included some lovely aquamarine and yellow colours, depicting tents crammed together at a festival with bright lights in the distance, and a muddy ground. 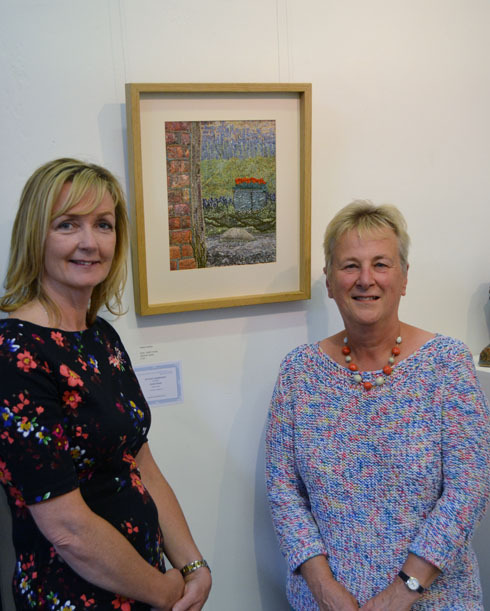 Other notable works include Neil Spalding’s Raiw Pottery, small models including some of Cornish mine buildings, Julie Robertson’s photograph at Ragley of flowers in a well-lit window and Sally Larke’s two framed sets of small ceramic pots, each with a different coloured inside to them. Maureen Grimwade has contributed A Cornish Haven, an oil on board work of a peaceful holiday beach, and Fiona Payne’s Washday is a vivid, bright work showing red and yellow houses against a bright background, and her Vacant is a heavily-worked oil. Michelle Carruthers is showing an unusual work of lines and shapes made up of tiny pieces of pollen on paper, thankfully behind glass. Shaun Morris who recently exhibited in Nuneaton’s Museum & Art Gallery is exhibiting Silence, showing the shadows underneath a motorway with the artificial yellow of lights showing in the background. 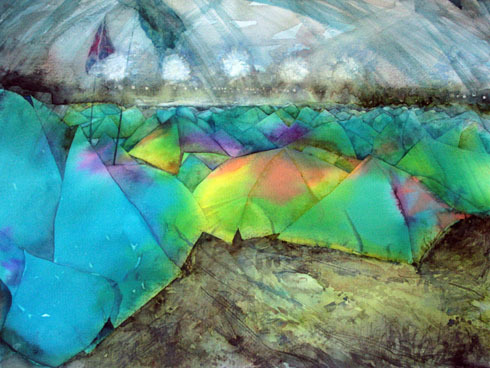 Earth Spirit by Pam White is a watercolour showing a warped person and unnatural vegetation. Open exhibitions can be very mixed and this has a lot of variety, but a good high standard to the work which combined with the interesting setting, and the possible chance to meet the artists currently working in studios in the same building, makes it well worth the trip out. The exhibition is on until September 7. 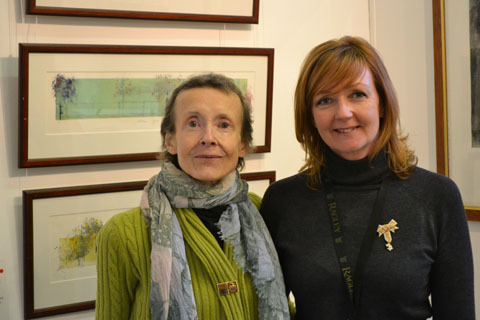 Knowledge can really help illuminate an artist’s work, and hearing her talk for nearly an hour about how passionate she is for her work was certainly a good introduction to a new exhibition in Warwickshrie. France Brodeur gave an illustrated talk about her exhibition, fittingly called A Lasting Passion, at Ragley Hall, before her exhibition opened in the Ragley Studio, in the picturesque nearby stable block, all organised by Dawn Harris who has an arts residency there and runs arts events on site. The invitation also included a cream tea in the tearoom and, well, it didn’t tie in with my current diet plan, but it was too alluring an opportunity to miss. 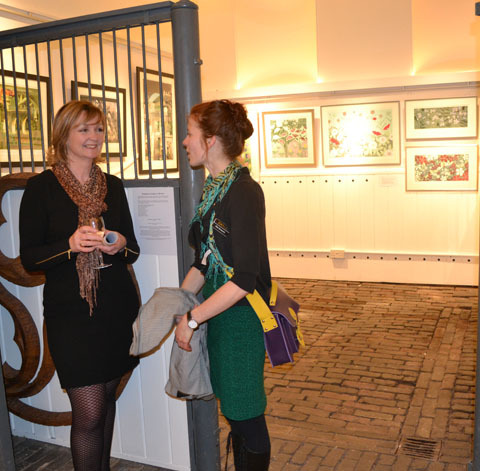 Location is everything so they say, and you can’t beat the setting of another exhibition by a lucky group of artists. Back in the spring, I was lucky enough to go to the private view at the start of Dawn Harris’s time as artist in residence at Ragley Hall, near Alcester. She explained then that the residency was called Negotiating Heritage, and she would be considering why heritage was important to the community. Along with Deb Catesby and Michala Gyetvai, she would be working from studios in stables at the Hall to create works there. The summer has ended with an exhibition from Dawn, Deb and Michala and eight other artists, all working around the Negotiating Heritage theme. It has to be the most impressive Private View I’ve ever sipped a glass of wine at. But then I’ve never been to an art exhibition opening at a stately home before. I drove through the large Capability Brown-designed parklands to park right in front of the very impressive portico of Ragley Hall. Inside, along with the other guests I enjoyed lovely nibbles, a glass of wine and a wander around some of the rooms of the Hall, which dates from 1680. The massive Great Hall, with baroque plasterwork by James Gibbs dating from 1750, has several other State Rooms leading off it, including one set for dinner for 24, a bedroom used by visiting royalty in the past and sitting rooms with old masters on the walls. From some of the windows the vistas stretch for miles across parkland, woods and a lake.